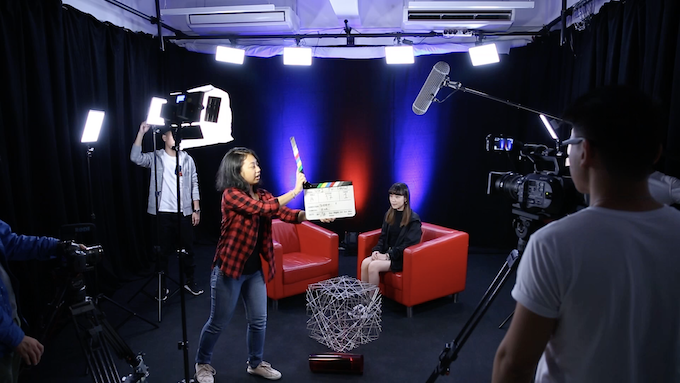 The Associate Degree in Media Production addresses the need for Professionals in the field of media production in Macao, covering extensive theoretical knowledge and practical skills, including but not limited to audiovisual production, editing and post production, photography, journalism, scripting, interactive media software design and development. Year 1 – The first year courses of the Associate Degree in Media Production offer theoretical and practical framework which provide students theoretical and hands on approach to communication design, development of art, and principles and practices of single-camera field production. Besides, specific techniques in creative writing and scripting are also included in the first year course with practice in writing journalistic articles on selected themes. Year 2 – The second year of the programme emphasises in video production, radio practice and sound production. Students can apply their skills and critical knowledge in audio recording and editing, science and art of music theory, audio technology, and acoustics and film sound in planning and producing in-class assignments and video short-fiction project. The purpose of this course is to offer students an introduction to Journalism and Public Relations, and an opportunity to practice it. This program means to introduce the potential of being creative through writing. Therefore, we will focus on learning how to experiment freely with the written word stimulating the imagination to communicate, research and express so that students can develop a personal style of creative writing and materialize their own original ideas with a free creative mind. Video Practice course provides an introduction to the principles and practices of single-camera field production. In other words, students will work in small production teams gainning hands-on experience in planning and producing two in-class assignments and a final video short-fiction project. The main goal of this course is to provide students with both applied skills and critical knowledge about the field of video production. - Post-production and delivery systems.